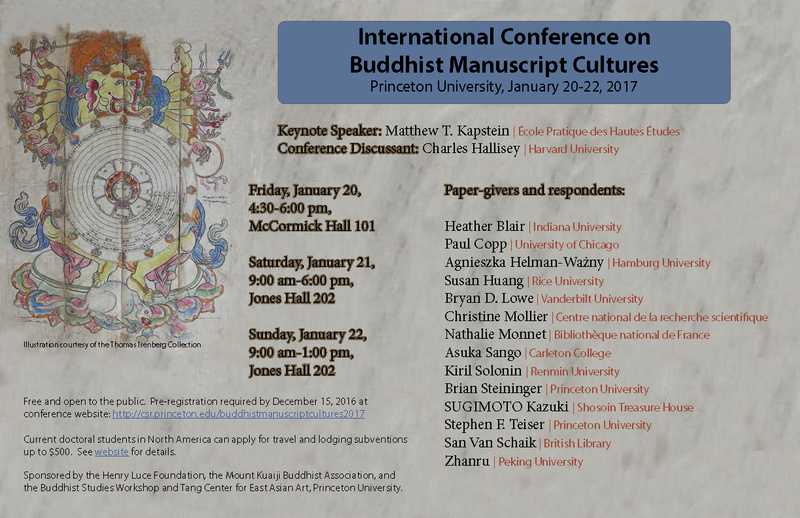 Please join us Jan. 20-22, 2017, for the International Conference on Buddhist Manuscript Cultures at Princeton University. The conference is free and open to the public, but pre-registration by Dec. 15, 2016, is required at csr.princeton.edu/buddhistmanuscriptcultures2017. We especially encourage applications from current doctoral students in North America for a limited number of travel and lodging subventions, up to $500 per person. After registering for the conference online, applicants should send a one-page CV and proposed budget to csr@princeton.edu. List of keynote speakers, participants, and further details are available in the image above and on the conference website.